Dangdae Bulpae, a three-time winner of the President’s Cup, has been retired. 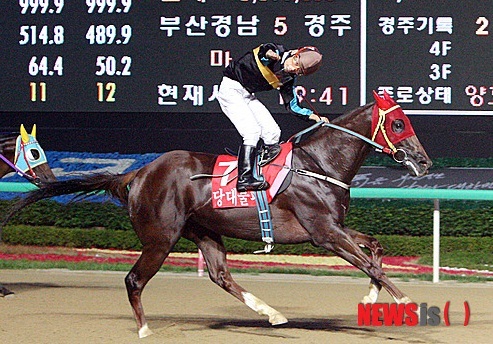 A winner of 19 of his 32 starts, Dangdae Bulpae won a Korean record 10 Stakes victories and amassed a record KRW 2.9 Billion (around US$2.6Million) in prize money. Among those Stakes wins were three consecutive triumphs in Korea’s richest race, the President’s Cup. By the unfashionable – and generally unsuccessful – Japanese sire Biwa Shinseiki and out of the Alydeed mare Indeed My Dear, Dangdae Bulpae debuted as a 2-year-old in 2009, running a rather inauspicious 5th place over 5-furlongs. He won his next 4 though, which was enough to allow him to take his chance in the 2010 Spring Classics. He could only manage 8th in the KRA Cup Mile but on his first trip to Seoul, he was an impressive 3rd in the Korean Derby behind Cheonnyeon Daero. The winner that day would spend most of the rest of his career looking at Dangdae Bulpae’s tail. 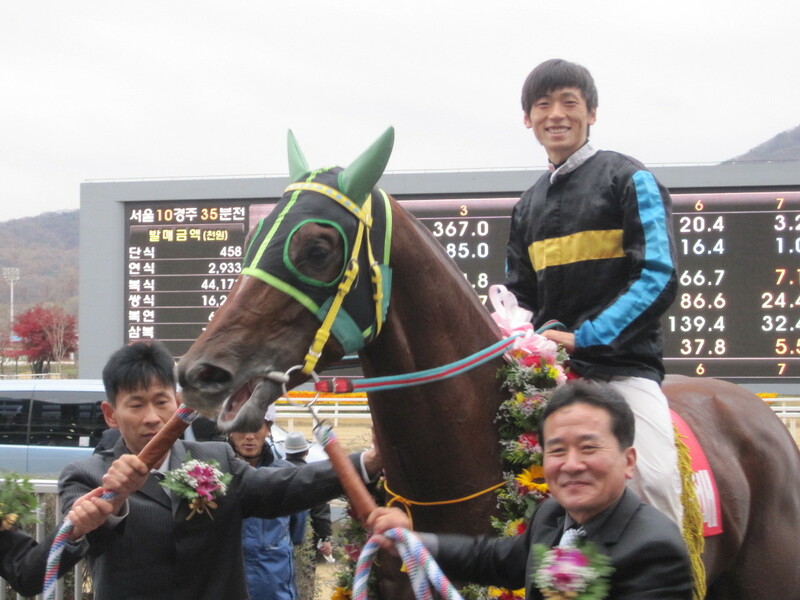 Maturing in the autumn, Dangdae Bulpae won the final leg of the Triple Crown, the Minister’s Cup and then landed the first of his President’s Cups. This set the tone for the next two years and although he had the occasional off-day – neither of his two attempts on the Grand Prix Stakes were successful – he and the late great Mister Park became the dominant Korean bred horses of their era. He generally came off second-best to Mister Park, including one comical afternoon where the two found themselves facing each other with 1st year apprentice jockeys on their backs as both trainers baulked at the weights they’d been assigned in the handicap. Most of the time though, things were serious and Dangdae Bulpae was a serious racehorse. While the 2300 metres of the Grand Pix proved out of his distance range, he did win the “Summer Grand Prix”, the Busan Mayor’s Trophy in 2012 in a another golden year that culminated in his 3rd and final President’s Cup triumph. 2013 saw him add another Stakes win – the Busan Ilbo Cup in February – but injury then intervened and it was a very different Dangdae Bulpae who lined up in Seoul last month to try for his 4th President’s Cup. He ran a shadow of his former self and retirement was immediately decided on. Dangdae Bulpae had done quite enough. Horse racing in Korea although run on the flat, is similar to jumps racing in that its stars can have reasonably long careers on the track. From a sporting point of view, this is an overwhelming positive as we get to follow our favourites for a number of years. From a welfare point of view, it relies heavily on owners doing the right thing by their horses both before and after retirement. Since I started writing this blog back in 2007, there have been perhaps two big “eras” of Korean racing. The first, from 2007 until mid-2010, was dominated by an American import, Dongbanui Gangja. However, the star of the second, from mid-2010 to the present, was the home-grown Dangdae Bulpae. He’ll be missed but has thoroughly earned his retirement to stud.